Project 333 is a fashion challenge for everyone interested in minimalism. You are invited to pick 33 items from your wardrobe and dress yourself with those items for 3 months. The idea of this so-called “capsule wardrobe” is not new. In the 1970, the term capsule wardrobe was coined by London based boutique owner Susie Faux. The concept is about dressing with a small collection of seasonally appropriate clothes, shoes and accessories, that can be mixed and matched easily. The lovely Courtney Carver of Be More With Less turned the idea of dressing with less into Project 333 in 2010 and has inspired thousands of people since then to minimalize their wardrobe – and other parts of their life as well. As a part of my resolution to make my wardrobe more sustainable, I decided to take on the Project 333 challenge and created my very first capsule wardrobe. What are benefits of a capsule wardrobe? There are multiple reasons why a capsule wardrobe is an awesome idea. I listed the most important benefits I have experienced so far while taking this minimalist fashion challenge. The (fast) fashion industry is the second most polluting industry on the planet. Creating a capsule wardrobe is one of the ways to lower your carbon footprint and to make your wardrobe more sustainable. 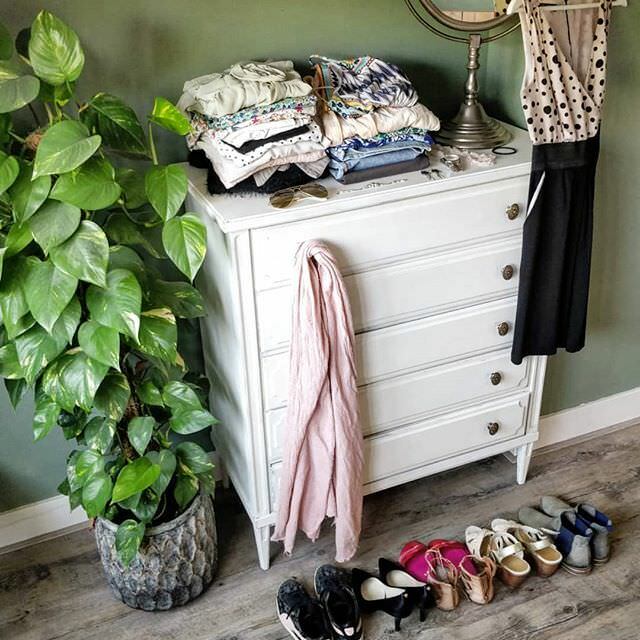 With so little items, your wardrobe becomes much more organized. You have a clear overview of the options you have. I put all the clothes that aren’t included in my capsule wardrobe in a suitcase and then stored the suitcase out of sight. Clutterfree closet = clutterfree mind, I promise you! I am not a fashionista at all (never have been, never will be probably) and I admire the men and women who are. However, Project 333 did spark my creativity. I started combining items I never thought of before. When you are only ‘allowed’ to pick 33 items for 3 months, it really makes you think about which clothes you love and want to wear. For me, this is one of the beautiful aspects of a minimalist lifestyle. You get rid of everything that doesn’t make you happy and are left only with the things that do. A research among East Asian and European consumers conducted by Greenpeace last year showed that up to 50% of the people buy more clothes than they actually need and use. Creating a capsule wardrobe will save you money that you would otherwise spend unnecessarily. The resarch also showed that the excessive shopping does NOT lead to happiness by the way. How to take this minimalist fashion challenge? I started with Project 333 on May 15th, 2018, so mine will last until August 15th. In the picture below I am showing you all the items (minus my winter coat) that I included in my tiny wardrobe for the next weeks. Note that accessories and shoes are also included! If you have half an hour left before you need to go to your job, that might not be the best moment to organize your Project 333. It took me an entire afternoon to pick the items I wanted to include. I have a pair of flower power pants, which I bought about 10 years ago. I still absolutely adore them, but they aren’t really easy to combine. Make sure that your capsule wardrobe includes enough basics. Think about (possible) events that you might attend in the next 3 months. I know for example that I have a wedding coming up in August, so my minimalist wardrobe includes one (and only one!) party dress. No challenge is the same. One of the biggest influences is the season you are preparing for. As weather in The Netherlands is super unpredictable I carefully chose items that allow me to dress for different weather types. Layers are my new best friends! If reducing your wardrobe to only 33 items for 3 months is too radical for you, create one that works for you. Make it 40 items. Or start with 33 items for one month and see how far you can extend from there. If you are being too hard on yourself, you might give up before you even started. This is not a challenge to suffer! I am only 10 days into my Project 333. So far I only experienced the benefits of it. Oh and I did use both a summer dress AND a winter coat. I guess the ‘seasonally appropriate’ Susie Faux talked about doesn’t really apply to Dutch tiny wardrobes. Once I finished my minimalist fashion challenge in August, I will make sure to follow up with a blog post about my experience. 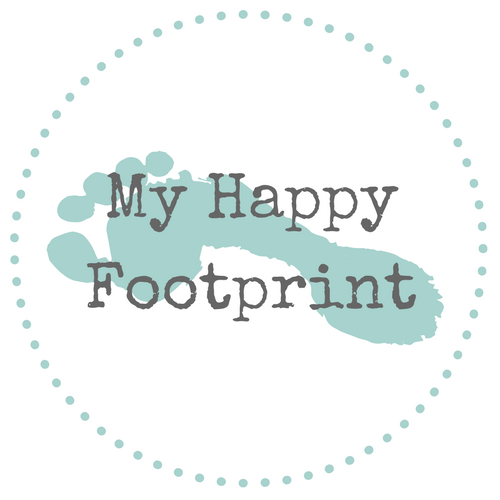 You can also follow My Happy Footprint on Instagram where I will post updates on the project regularly.